* Replaced the spikey treecactus with another object, due to severall requests. Please delete any old installation before you use this one! Hello, and first, thanks so much for this great game !!! I don’t know if it’s the right place for a bug report, but, well, here we go ! – The sound volume is really too loud at start and worst, when you try too changing it, first it goes to the loudest possible ! Level 43, at start, just after the first flame, the jump is near impossible to do ! 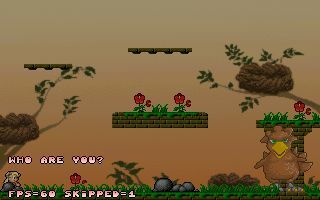 I’ve tried and tried and tried, and finally passed the gap on only one pixel ! 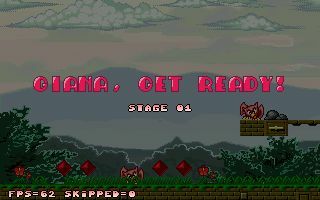 -Maybe all my problems are coming from a little too “edgy” collision detection, I have even see my Giana missing the edge of a cliff by moving back one pixel when reaching it, like sliding on it… Or be killed by flames even without touching it (I swear…). -It’s not a bug, but just a question : What is the advantage of going “big” except the fact you can break block with your head ? I haven’t seen any other difference (more life, higher jump…). Hey, it’s me again ! Good luck in fixing the bugs, and another time thanks for the game ! great job but when will the ubuntu version be released? probably with the win32 version or just after. I noticed the file was updated to public beta 3 today. Another time a really big THX for all your efforts ! why not a GBA version?